The Deputy Minister of Education in-charge of Primary and Junior High Schools (JHS) and Member of Parliament for the Cape Coast North constituency, Barbara Asher Ayisi, has inaugurated a five classroom block for Family Outreach Ghana, a non-profit organisation. 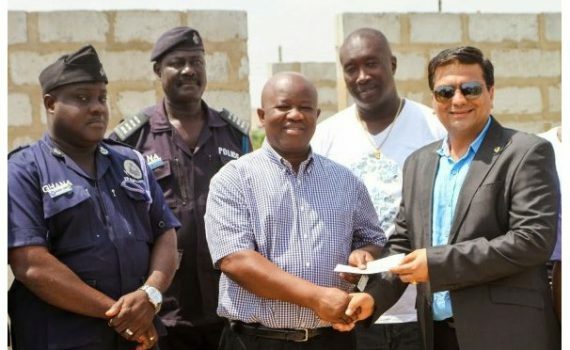 The DDG Charitable Trust & Friends, a group of Indian business people in Ghana, funded the classroom block with the aim of giving back to society. At a short but colourful inauguration ceremony held on Thursday at Spintex, a suburb of Accra where Family Outreach Ghana is located, Madam Ayisi lauded the charitable organisation and the NGO for the initiative stating that giving to the needy is what humanity is meant for. She said the initiative by the DDG Charitable Trust & Friends was good for the development of the country. “We encourage these gestures by the private society. We urge people to do their little bests in their little communities to complement the good job the Nana Akufo – Addo government is doing,” she urged. The Indian High Commissioner to Ghana, Sri Birender Singh Yadav stated that the Indian community in Ghana was committed to the educational sector of the country and the general well being of the less privileged. Mr Mukesh Thakwani, CEO of B5 Plus and a member of the DDG Charitable Trust & Friends, was also present at the inauguration ceremony. According to him the Indian business community in Ghana takes its social responsibility seriously, and projects such as this are but one example of its involvement to support the community. “Although we are involved in various charitable ventures, B5 Plus has been placing a great emphasis on education as the future of any country depends on the quality of its youth when it enters life after school,” Thakwani said. Family Outreach Ghana, the NGO which facilitated the building of the ultra-modern school block facility was grateful to the DDG Charitable Trust & Friends for funding the project. It noted that the classroom would facilitate the NGO’s aim to empower the less privileged in society. Family Outreach Ghana is a non-profit humanitarian organisation consisting of individuals of different nationalities, backgrounds and experience. All the people at Family Outreach Ghana are non-salaried volunteers dedicated to the common goal of improving people’s lives. Providing support to youth organisations for the development of their communities. STEEL AND iron manufacturing giant, B5 Plus Ghana Company Limited has been adjudged the best metals, building and construction company of the year 2017 by the Association of Ghana Industries (AGI). The sixth AGI awards ceremony was held on November 11, 2017, at the Banquet Hall of State House, Accra, and was attended by the President of the Republic of Ghana, Nana Addo Dankwa Akufo-Addo, and captains of industry. B5 Plus Limited beat several other contenders to add the prestigious award to its arsenal of awards. 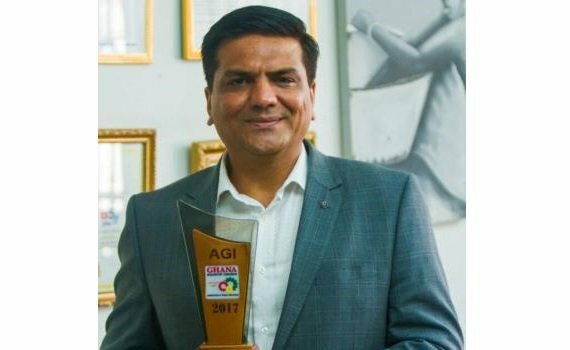 Commenting on the award, Chairman of B5 Plus Ghana Limited, Mukesh Thakwani explained that the company felt really honoured for the recognition by AGI. “We are honoured to say that we were one of the nominees for best company of the year award as well,” he said with smiles beaming all over his face. Asked what he thought differentiated B5 Plus from other players in the industry, he said attention to quality and service has been a major contributor to the company’s success over the years. Also, he indicated that the company has made several efforts over the last 15 years of its existence to support the needy through its corporate social responsibility initiatives. 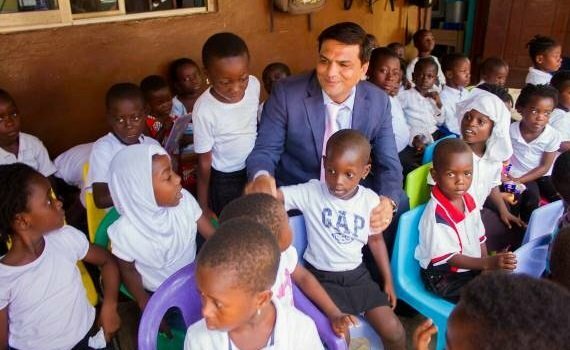 One key aspect of its CSR activities, he said, was in the area of education, which he claimed has led to the group setting up the Delhi Public School International (DPSI) Ghana to provide quality and affordable tuition to learners across West Africa. On the future prospect of B5 Plus Limited, Mr. Thakwani explained that ‘one stop shop for iron and steel’ company was making plans to expand its operations in Ghana by tapping into government’s one district one factory initiative. B5 Plus Ghana Limited was established about 15 years ago with corporate headquarters in Tema, and was initially importing steel and iron from Cote d’ Ivoire and South Africa but has grown to the stage where it now exports to other countries. B5 Plus Limited operates in all the 15 Economic Community of West African States (ECOWAS) countries. The company’s principal product is steel products which come in seven major categories: Mild Steel, High Tensile & Iron Rods, Galvanized Products, Stainless Steel, Marine & Mining, Roofing & Nails and Concrete & Fencing. Its vision is to become the world’s steel industry benchmark through the excellence of its people, its innovative approach and overall conduct. DELHI PUBLIC School International (DPSI), Tema and its parent company, B5 Plus Company – steel and iron rods manufacturer – have joined hands with the rest of the Indian Community in Ghana to celebrate India’s 69th Republic Day and Freedom 70. Activities commemorating the two events, which are important milestones in the history of India, commenced with a series of classical dance performances on Thursday, January 25, at DPSI campus in Tema. Later on Friday, January 26, a special ceremony was held in Accra at the residence of the Indian High Commissioner to Ghana, for the Indian community, and students from various Indian learning institutions were given the platform to perform India’s rich cultural dances and recite poetry to the admiration of all gathered. India became a republic on January 26, 1950. This was the second major milestone in its nation-building process after it gained independence two years earlier. Special prizes were given to the students; notably those from DPSI whose performances were adjudged to be fantastic. On the occasion at his residence, the Indian High Commissioner, Birender Singh Yadav, read a speech delivered by the President of India, Shri Ram Nath Kovind, to Indian Communities around the world on the 69th Republic Day celebration. The speech appealed to Indians to be each other’s keepers, support their government to build a better and prosperous nation for all Indians and to be innovative and fight for equality for all, especially between boys and girls. “A happy and equal-opportunity nation is built by happy and equal-opportunity families and communities; families where girls have the same rights and the same access to education and healthcare as boys,” according to the Indian President in his speech as read by the High Commissioner. Director of DPSI and Chairman of B5 Plus Company, Mukesh Thakwani, said the celebrations were important moments for Indians. 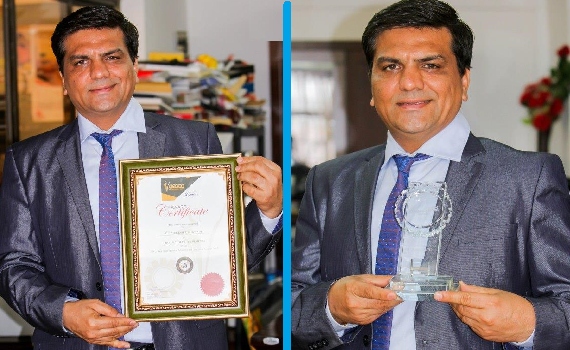 Mr. Mukesh V. Thakwani, the Chief Executive Officer (CEO) of B5 Plus Limited, the most patronized steel manufacturing company in Africa has been named the “Industrialist of the Year” at the Ghana @ 60 edition of the Ghana Entrepreneurs & Corporate Executives Awards (GECEA). This recognition attests to the commitment the company has made to become the leading steel manufacturing company in the West African sub-region. It also displays the business leadership and vision in founding B5 Plus Limited and its expansion to become a leading exporter of steel in the sub region. Through its broad range of operations, B5 Plus Ltd has created jobs for several youth in the country thus assisting to improve standards of living and hastening the socio-economic development of Ghana. The event held at the Banquet Hall of the State House in Accra is an initiative of Entrepreneur Foundation of Ghana (EFG) in collaboration with the Ministry of Trade and Industry. The GECE Awards 2017 is a premier competition for emerging entrepreneurs, corporate executives, established business owners, innovative and creative entrepreneurs who own and operate businesses. The ones selected are given recognition for their achievement in business development. This year’s event under the theme: “Promoting Economic Growth through Private Sector Development and Corporate Governance,” aimed to enhance business relationship between entrepreneurs and business executives and also promote government’s private sector development initiative. In the 15th edition of the Ghana Club 100 ranking organised by the Ghana Investment Promotion Centre (GIPC), B5 Plus Limited improved its position to the 19th position as the most prestigious company in Ghana currently. Under the auspices of GIPC, the ranking uses three main criteria; size of the company, growth and profitability to arrive at the Club 100 list. Mr. Mukesh V. Thakwani who is the Chairman of B5 Plus and Delhi Public School (DPS), International Ghana who expressed excitement about the recognition dedicated the award to customers and workers of the steel manufacturing company. According to him, the hard work exhibited by the workers and the trust repose in his company’s products by customers who cut across Africa and who continue to patronize the company’s products brought about the award. He pointed out that this recognition will encourage him and his company to invest more and improve on its operations to continue to offer quality products to its cherished customers. Since its establishment, B5 Plus Ltd has a vision to become the best in the world’s steel manufacturing industry through the excellence of its workforce, its innovative approach and overall conduct. The company’s steel products remain the most sought for due to their durability and efficiency in all the ECOWAS countries it serves. B5 Plus Ltd’s steel products come in seven major categories: Mild Steel, High Tensile & Iron Rods, Galvanized Products, Stainless Steel, Marine & Mining, Roofing & Nails and Concrete & Fencing. 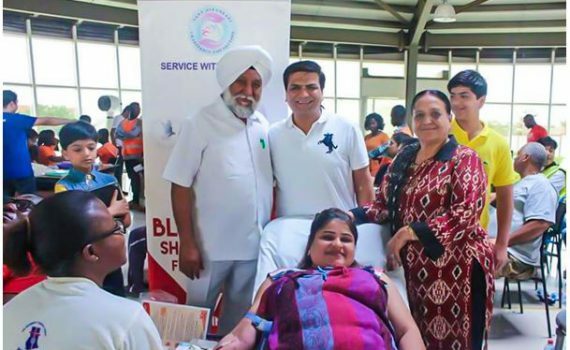 Over hundred people set aside their daily responsibilities and thronged the Delhi Public School (DPS) International, Ghana at Tema to participate in a blood donation campaign. 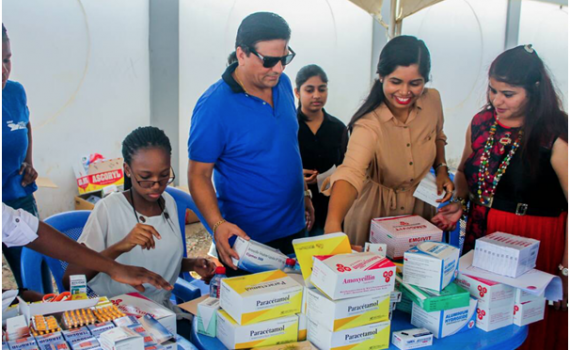 The exercise taken place in DPS international, Ghana was supported by Sant Nirankari Charitable Foundation, a humanitarian organisation in Dubai. The blood donation exercise was organized to save lives of patients at the Korle-Bu Teaching Hospital and other health facilities in the country. Donors from all walks of life who were eager to donate, started trooping into the premises of DPS International, Ghana at Community 25 at about 5:00 am to participate in the highly successful exercise. B5 Plus Limited has organized Health Checkup Camp. Charity from B5 Plus Ltd. We believes in Service before self always. 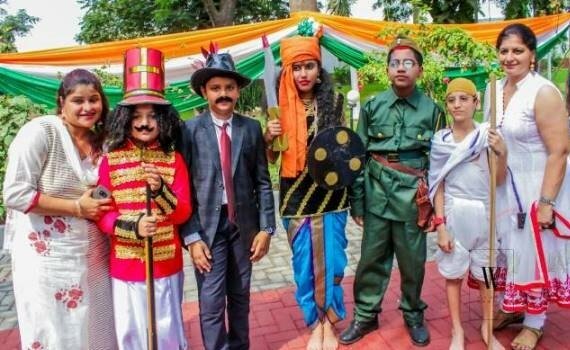 DELHI PUBLIC School International (DPSI), Tema and its parent company, B5 Plus Company - steel and iron rods manufacturer - have joined hands with the rest of the Indian Community in Ghana to celebrate India's 69th Republic Day and Freedom 70. Hundreds, spotting branded t-shirts with matching trainers and sneakers thronged the forecourt of the State House in Accra last Saturday, to participate in interesting Yoga exercises; some for the first time. Kpone Barrier, Aflao Road, Opp. Kingdom Transport, Tema. WELCOME TO B5 PLUS LIMITED, GHANA.